The Turkish Van is a recognised cat breed that is known for its unusual love of water and swimming. They were created from the cats native to the Lake Van area. Originally called in the West the Turkish Cat, the name was changed in 1979 in the U.S. (1985 in the U.K.) to Turkish Van to better distance the breed from the Turkish Angora cat which had its origins around Ankara, in central Turkey. The coat is the most fascinating trait on this cat. The climate change in Eastern Anatolia region throughout the year seems to have designed the cat's coat over time. Eastern Anatolia is mountainous, and Lake Van sits over 5,260 ft (1,600 m). above sea level. The area faces such extreme temperatures during the summer and winter seasons that it is almost inhospitable. The semi-long haired, water resistant single coat, is thick in winter but very soft, like rabbit fur or cashmere. At maturity, the cat will have a winter mane. During the spring and summer months when it becomes extremely hot, the long hair on the body is shed for a shorter coat that retains the cashmere feel. The hair on the tail remains long throughout the year and has the appearance of a bottle brush.Traditionally, in the cat fancy, Turkish Vans are recognised as patterned cats with colour restricted to the head and tail with the body of the cat being white. However, in Turkey, the cat is recognised in an all-white form as well as the form with red patterning and a "fox tail", and with blue eyes, amber eyes, or one eye of each colour. Many van-patterned Van cats have a small mark on the coat between the shoulder blades.This mark is called "The thumb print of God". This mark can also be seen in red and white van-patterned Turkish Vans, i.e. 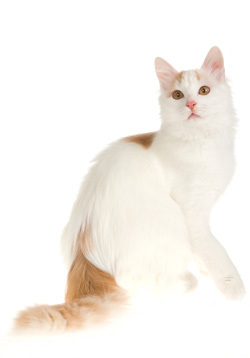 the Turkish Van cats of classical colour. The spot on the left shoulder, resembles the shape of the print of a thumb due to the presence of the agouti gene, which is responsible for tabby coloration and always present in red colour in cats, giving rise to lighter and darker tones in the red marks of Van cats. The mark on the left shoulder can look as if the coloration was pressed out from the centre to the periphery under the pressure of a finger. The Kurds call this mark �the thumbprint of God�s right hand�, and consider it a sign of good luck. There is a local legend telling that God blessed the Van cat by putting His right hand on it as the cat left Noah's Ark. In the places on the cat�s coat where the Creator had touched it (head, shoulder and tail), the flaming marks appeared.